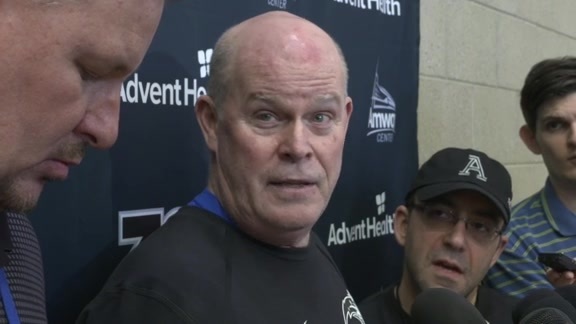 ORLANDO – Nearly a week ago, the Orlando Magic were in the same position they are now – coming off a frustration-filled loss and heading into a difficult set of back-to-back games at the Amway Center over the weekend. Last time around, that scenario proved to be fruitful for the Magic as they erased the pain of a second-half faltering in a loss to the Utah Jazz with stirring home wins against playoff powers Boston and Houston last weekend. Now, on the heels of Wednesday’s crushing 120-115 overtime loss in Detroit, Orlando is hopeful that it can once again bounce back in a big way against two more teams that could very well be headed to the playoffs. The Magic (19-25) start what figures to be a difficult back-to-back set of games tonight with a showdown against the vastly improved Brooklyn Nets (23-23). Then, on Saturday the Magic will be hosting the leaders in the Eastern Conference, the Milwaukee Bucks (32-12). Adding to the intrigue of tonight’s game, Brooklyn is three games ahead of the Magic in the standings. Mo Bamba, the No. 6 pick in last June’s NBA Draft, will make his return tonight after missing the last four games with a sore left foot. Bamba worked out with full contact on Thursday and was deemed ready to return tonight against Brooklyn. He will back up starter Nikola Vucevic, moving Khem Birch back to a third-string role. In their 30-year history, the Magic have played home games on consecutive nights 20 times. The home/home back-to-back sets of games is a relatively new phenomenon in the NBA as they give teams a shot at hosting something of a homestand during the NBA’s marathon season. This will be Orlando’s third home/home back-to-back of the season, and it is hopeful that it will be a third sweep. The Magic beat the Lakers and Knicks on Nov. 17-18 and they rallied to topple the Celtics and Rockets this past Saturday and Sunday. To get back on the winning track, the Magic will need to remedy their issues from Wednesday’s loss in Detroit. Orlando set new season highs for field goal percentage for a quarter (75 percent in the first quarter) and for a half (67.5 percent in the first 24 minutes), but it never opened more than an 11-point lead because of defensive breakdowns. Those defensive struggles continued into the second half, and when their shooting cooled off in the second half, the Magic found themselves in an 11-point hole with 10 minutes to play. Orlando would rally late in the game – just as it did in the victories over Boston and Houston – and actually led 109-107 with less than two minutes to play. However, the Magic couldn’t keep Andre Drummond off the glass late in regulation and his put-back basket with 32.9 seconds remaining forced overtime. And Orlando offense that was so hot early in the game ground to a halt late in the night. The Magic missed their final two shots of regulation and then made just two of 12 tries in OT – both of the makes coming on Terrence Ross 3-pointers – resulting in the frustrating loss to a Detroit team that moved ahead of them in the standings. Brooklyn has been one of the surprise teams of the year in the NBA. After starting the season 8-18, the Nets have gone 15-5 over their last 20 games to reach .500. Much like the Magic last weekend, Brooklyn beat Boston and Houston in the days leading up to tonight’s game. Now, the Magic are hopeful that another set of home games can help them right their season once again. To win tonight against Brooklyn, the Magic will need to play with a purpose defensively, Fournier said.